CameronMathews.com: One Way To Get Free Money! One Way To Get Free Money! How would you like to claim your share of $24 billion? That's the estimate of how much money was unclaimed in a report by Financial Engines, an independent investment adviser firm after researching the behavior of 4.4 million retirement plan participants. What kind of money? 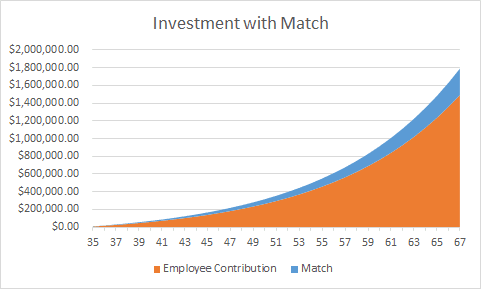 Employer matching to 401(k) plans. By now I'm sure you've read my post on saving as soon as you can for retirement (if you haven't, you can take a few minutes to read that one and then come back). So, you are familiar with the plight of Bob. He's the guy that made the national median household income of $51,939 and earned a good 9.3% on his investments (once he started investing at age 35). Rather than continue to bash Bob for waiting so long to invest, though, I'll give him kudos here. 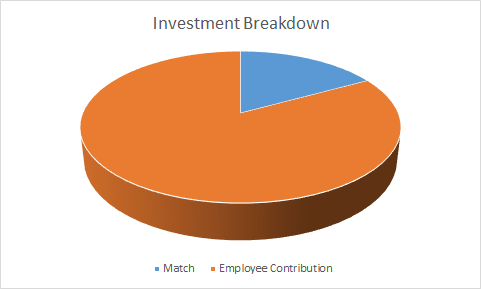 He had an employer matching program that matched fifty cents on the dollar up to the first 6% of his investment (this, by the way is just the most common 401(k) fixed match plan out there, and by no means represents everything). If you remember, Bob ended up with just over $1.4 million dollars at 67. If you don't remember, seriously, go read that post first. What I did not mention in that post was that if he had the employer match which I am now claiming he does, he actually ended up with just over $1,790,720.00 at the same age. That is an extra $298,000 over the life of the account if you are keeping score. If you want to think further, it contributed 17% of his overall wealth. The real trick is that even if Bob only invested 6% of his annual income in the 401(k) instead of 15%, he still would have ended up with that extra $298,000. Because his employer match maxed once he was contributing 6%. That money came directly from the employer and not out of Bob's income. Nothing to lose. And yet millions of Americans fall short of the amount required to capitalize on their employer match. In Bob's case, that's $1558.17 of free money every year. Free money. Are you fully utilizing your employer match? If not, how much money are you leaving on the table? I'm interested in starting a discussion if you want to shoot me a tweet over on Twitter.